More Advice from an Owl!! This is a long card that will fit into a regular business sized envelope. I created branches from punched out leaves and flowers and perched the "fussy cut" owls from the Technique Junkies Stamps You're A Hoot set - www.techniquejunkies.com/you-are-a-hoot-set-of-7/. The owls were colored with Copic Makers, and embellished with Nuvo drops and Diamond glaze. The sky and grass were sponged on. You may also use the TJ10Judy and get 10% off of anything on the Technique Junkies website. And now the end of May is nigh -- I hope it is great for you, and you get inky! 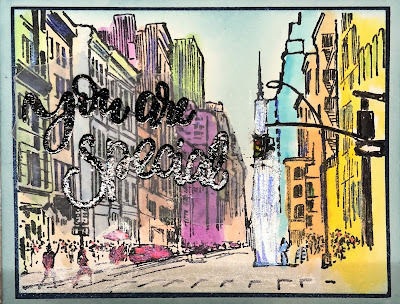 www.techniquejunkies.com/city-watercolors/. As the name might suggest I water colored the scene. Then I heat embossed Technique Junkies Stamps Your Are Special - http://techniquejunkies.com/you-are-special/. I added Diamond Glaze to the traffic light. Wink of Stella was added to some of the buildings. 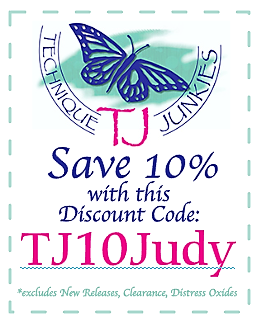 You may use the code TJ10Judy and get 10% off of anything on the Technique Junkies website. I hope your day in May is just wonderful and that you have time to get inky today! 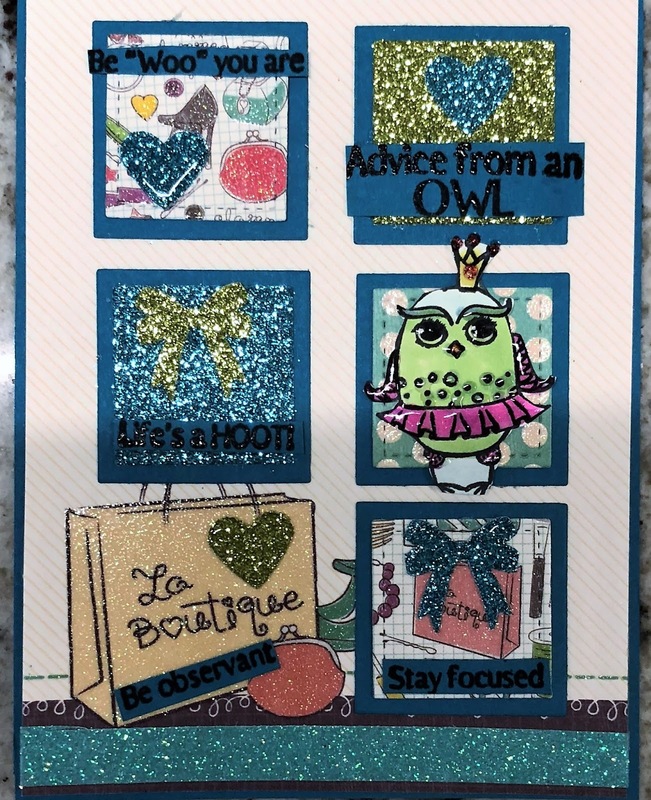 Most of the time I use Technique Junkies Stamps on my blog. But I have lots of stamps from lots of other companies. 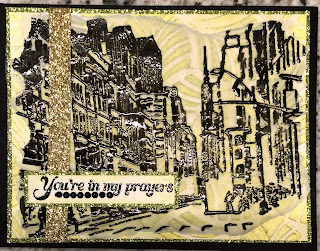 This one is called Waterfront and is from Stampin' Up!. The little tufts of grass is from Art Impressions. I used some Colorburst on the mountain stamps just directly and then misted it with water. This is the second or third generation of using the stamp in this way. I added some definition to the mountain tops with a water based marker and blended it in a bit. I sponged on the sky a bit over some the sky that was inked a bit with one of the stamps in this set. I couldn't get it to blend the way I wanted. This card is from a "experimenting day." 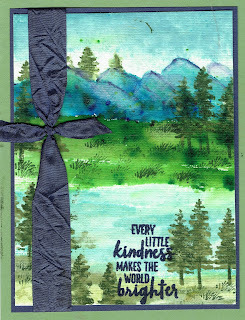 Do you have days like that -- where you decide to use a stamp set and then experiment to see what you come up with? That is what I did. 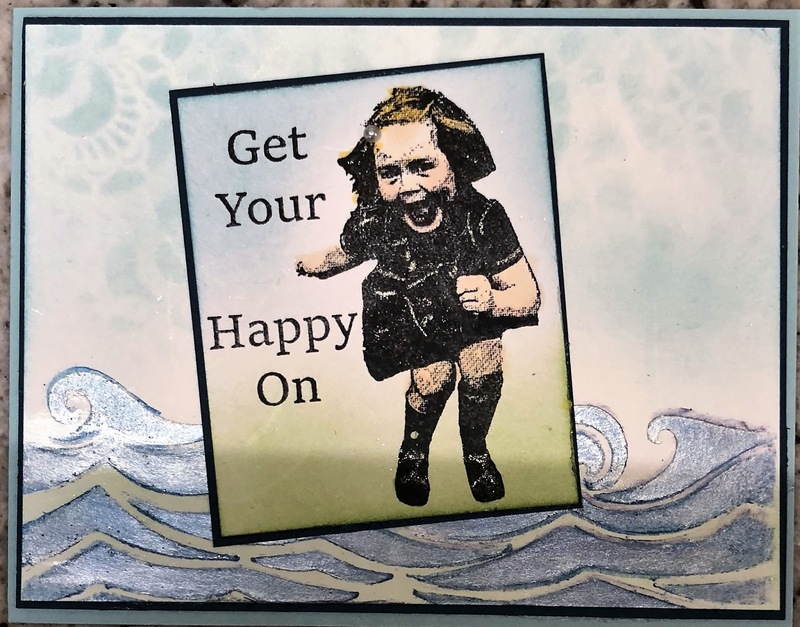 I first looked at Pinterest and Splitcoast Stampers for ideas. Then I experimented . 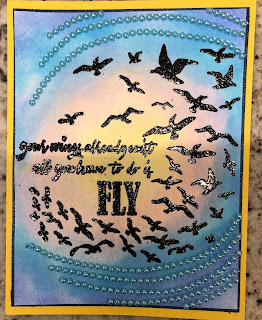 To me one of the wonderful things about stamping is that you look at cards and create your own focal image that is very different than what the other card was. I wanted this to look like it was watercolored. I think it has that look, do you? Have a wonderful day -- and get inky! Maybe experiment a bit! I have had this background paper floating in my stash for some time and I wasn't sure just how to use it. 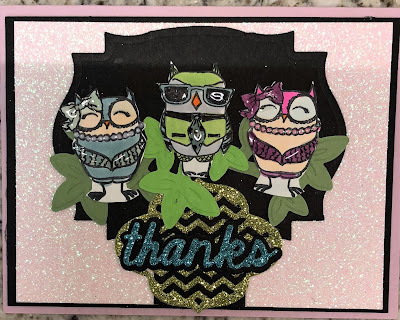 It seemed to me to go perfectly fine with this Princess Owl from the Technique Junkies Stamps You're a Hoot set - www.techniquejunkies.com/you-are-a-hoot-set-of-7/. I chose a variety of glimmer paper for the different squares and the embellishments. I enlarged the card a lot so you can easily ready the "advice" from Miss Princess Owl. The "advice words" are heat embossed. Hope your day is grand, and you have a chance to get inky. www.techniquejunkies.com/you-are-a-hoot-set-of-7/. 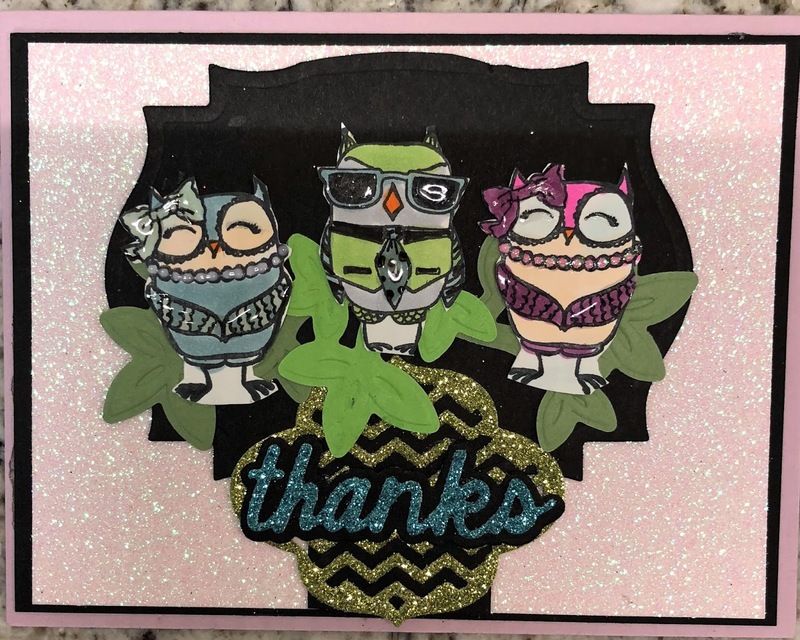 I used a died cut frame and squares to highlight each "fussy cut" owl. Each owl was colored with Copic markers and embellished with Nuvo drops and Diamond Glaze. The leaves at the bottom were drawn with green Nuvo drops. The verse was heat embossed. A great day is yours for the having -- especially if you get inky! www.techniquejunkies.com/you-are-a-hoot-set-of-7/. The owls were "fussy cut" after after being colored with Copic markers and embellished with Diamond Glaze. Die cuts were used to add interest and embellishments. I hope a great day is being enjoyed by you, and that you have a chance to get inky. 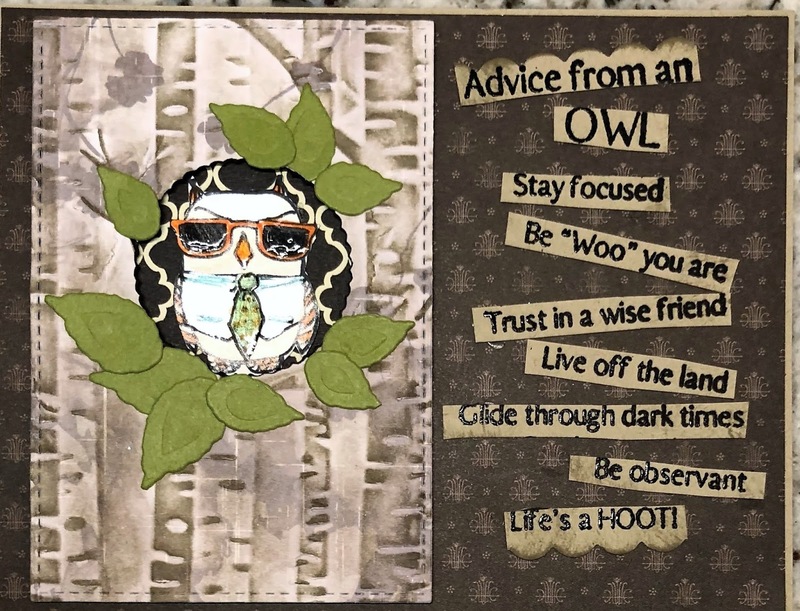 More advice from the owls in the Technique Junkies Stamps You're A Hoot set - . www.techniquejunkies.com/you-are-a-hoot-set-of-7/. Balloons are die cut. Owls are colored with Copic markers and embellished with Nuvo drops and Crustal Glaze. The owls are "fussy cut." The words are heat embossed. 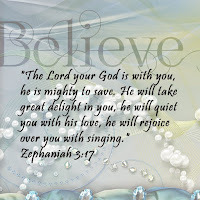 Have a wonderful day -- hope the sun is shinning on you today. Be sure to get inky! 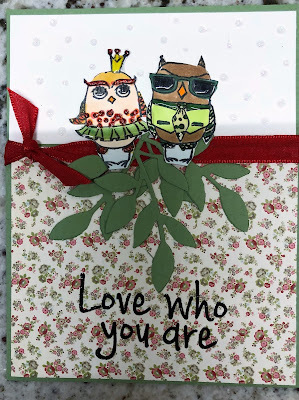 A Mid Month Blog Hop for NEW Stamps!! What Is NEW??? Usually the Technique Junkies Stamps NEW stamps blog hops are held on the first of the month, BUT today is a special day and a special blog hop! 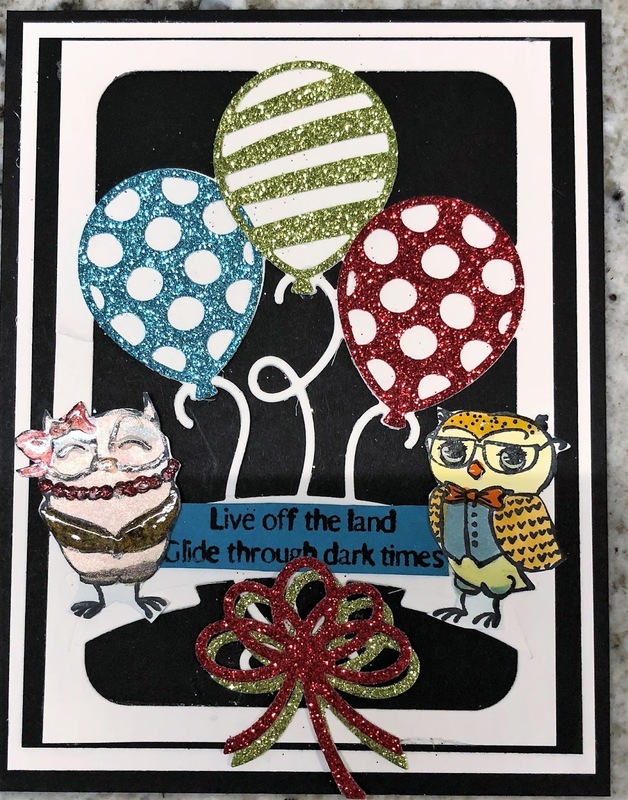 We have a new stamp designer for Technique Junkies Stamps!!! WOO HOO! And we all hope you all really like these 10 NEW stamps! All 10 of these new stamps are drawn by Rita Barakat and they can be found here: techniquejunkies.com/special-release-rita-barakat-designs/. 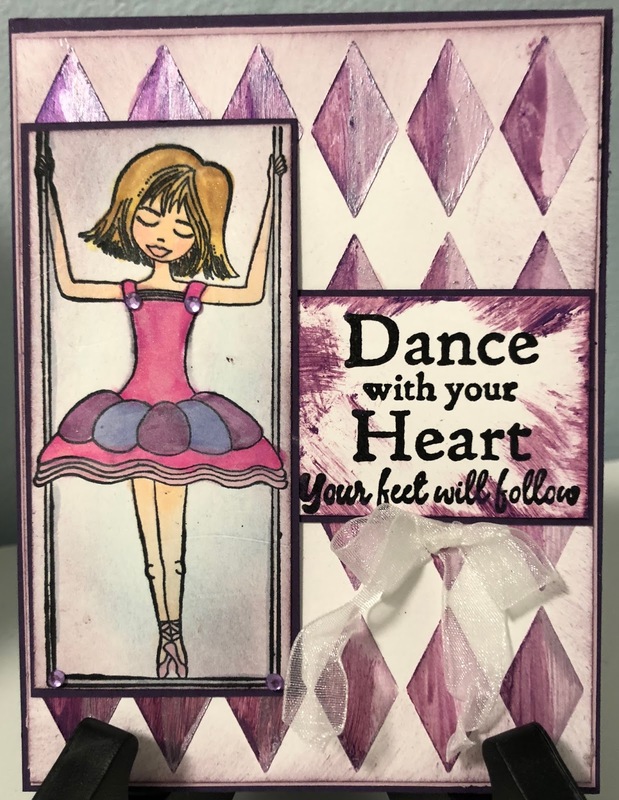 The Technique Junkies Design Team is joining the Design Team for Barakat Designs with this blog hop so you may see some different designers on the hop today. The hop begins here: https://techniquejunkies.blogspot.com/2018/05/technique-junkies-new-illustrator-hop.html . Today we are intermingling the two design teams for one hop. Please be sure to follow along! There is going to be a prize! You should have arrived at my blog from the inspiring blog of Yolie Burke - http://www.justyolie.com/. I have two cards for your viewing pleasure and of course all stamps are Technique Junkies Stamps! 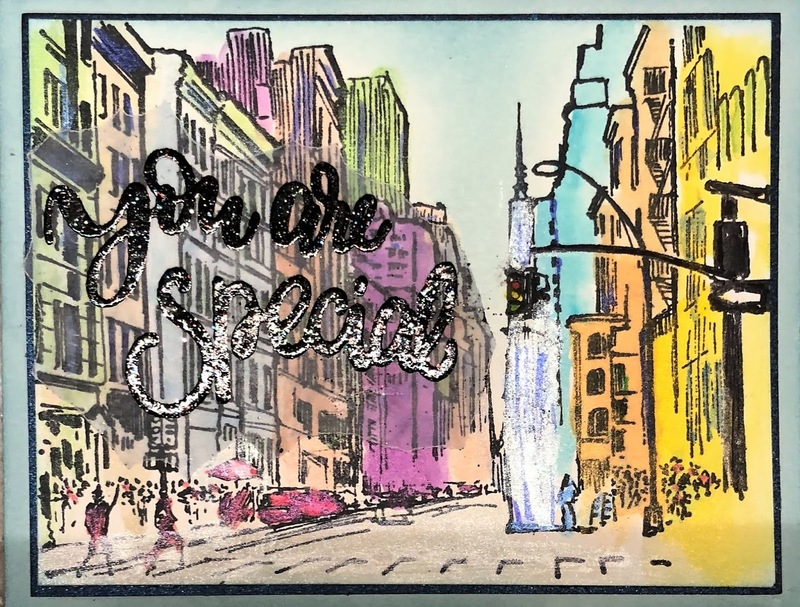 I have also used Art Nuvo Embellishment Mousse - http://techniquejunkies.com/products-and-accessories/nuvo-mousse/ , and stencils from A Colorful Life - http://techniquejunkies.com/a-colorful-life-stencils/ . This first card uses the Rita Barakat Technique Junkies stamp called Ballerina - techniquejunkies.com/ballerina/ -and the Technique Junkies stamp called Dance - techniquejunkies.com/dance-with-your-heart/. She is colored with Copic markers. The verse is heat embossed with Versafine black ink and clear embossing powder. 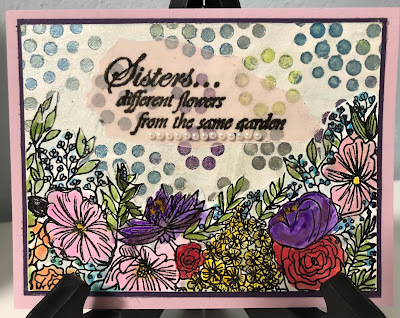 The stencil is from A Colorful Life stencils with Nuvo Embellishment Mousse in two different colors. I sponged some embellishment mousse around the edge of the verse. This second card uses Rita Barakat Technique Junkies Stamp Floral Border - techniquejunkies.com/floral-border/ - and the verse is Technique Junkies Stamps Different Flowers - http://techniquejunkies.com/different-flowers/ . 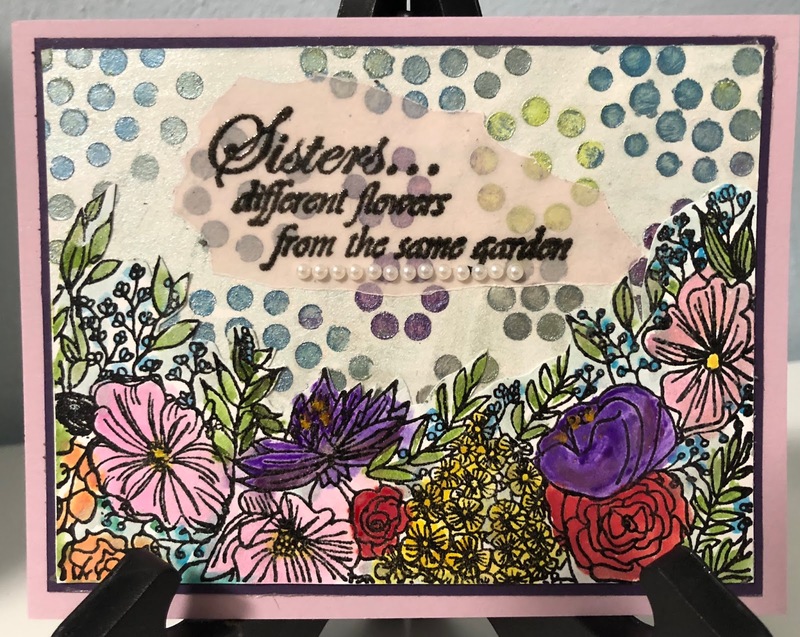 I used a lovely stencil from A Colorful Life Stencils with Nuvo embellishment Mousse repeating the same flower colors that were painted with Twinkling H2Os. The flowers are on a separate piece of card stock than the stenciled card stock. I sort of fussy cut around the upper border of the flowers. 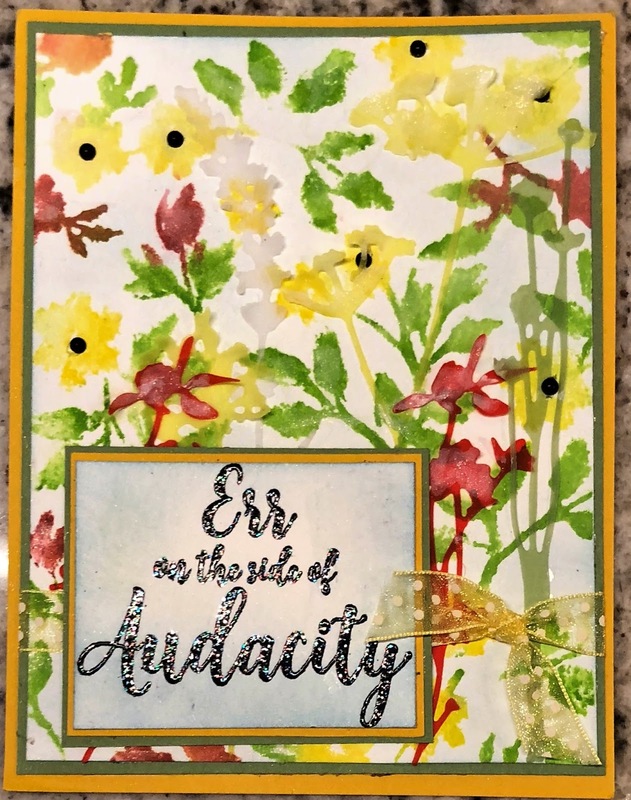 However, the reason it looks like it is all one piece of card stock is that i chose to paint the same pale blue shade of Twinkling H2Os behind the flowers and behind the little dots. The verse was heated embossed with clear embossing powder on vellum. 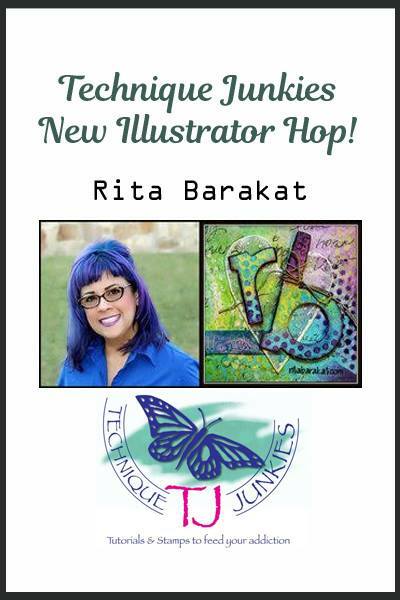 There is no special 15% discount for this blog hop HOWEVER, you CAN USE the discount code TJ10Judy and get a 10% discount on all of the new Rita Barakat Technique Junkies stamps as well as 10% discount off of everything else in the Technique Junkies Stamps web store - http://techniquejunkies.com/ . Please make sure you comment on all the stops along the hop. One lucky person who comments will receive a $25 Technique Junkies Gift Certificate! Comments will be open until Saturday May 19th and the winner will be announced May 20th on the Technique Junkies Blog. Next in the Blog Hop is Kathryn Morrow - https://whimseygirl.blogspot.com/2018/05/rita-barakat-and-technique-junkies_14.html?m=1 . I hope you have both enjoyed and have been inspired on our blog hop today! Have a great day -- and get inky!! 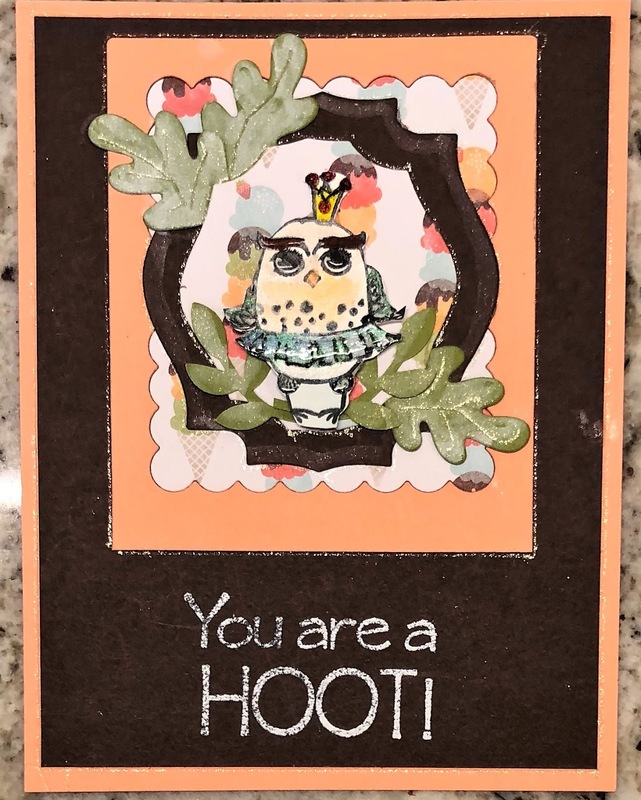 Some die cuts add to the interest of this owl card using the Technique Junkies Stamps You're A Hoot! - www.techniquejunkies.com/you-are-a-hoot-set-of-7/. The princess owl was colored with Copic markers and embellished with Nuvo drops and Diamond Glaze. The words are heat embossed with white embossing powder. This is one of my several cards made with the Technique Junkie Stamps You're A Hoot - www.techniquejunkies.com/you-are-a-hoot-set-of-7/. . The owls were colored with Copic markers, and details were added with Nuvo drops and Diamond Glaze. They were fussy cut. 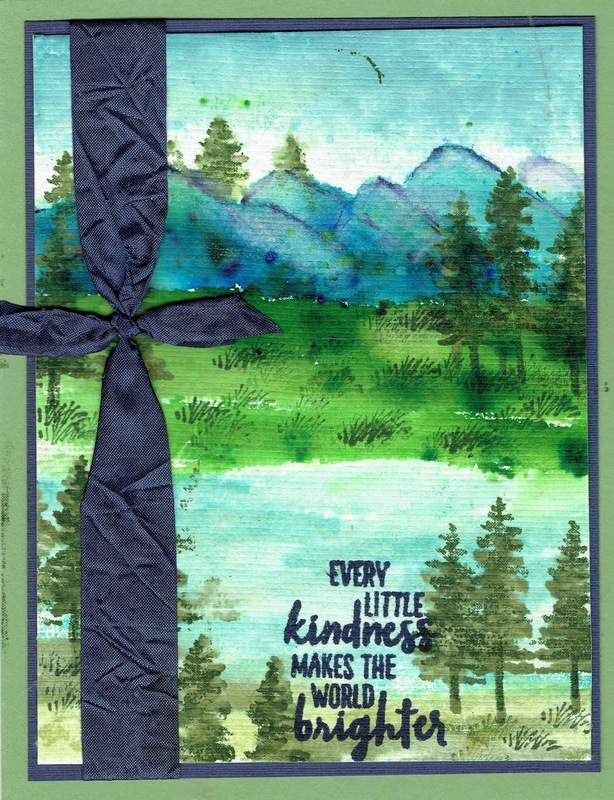 A layer of designer paper, some punched leaves and a ribbon finish the card. Hope your day is a great one, and get inky! I wanted to give this card a "swirl" look. I used Technique Junkies stamp Fly - . http://techniquejunkies.com/fly/. 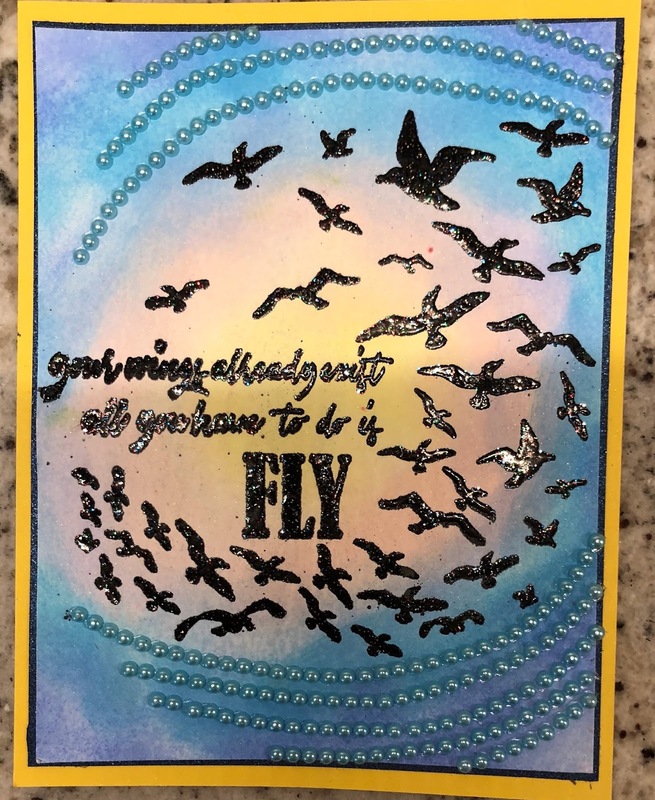 I heat embossed it, and then using sponges I swirled on colors of a sun rise when the birds wake up and start flying around. I started with the yellow and worked my way put. To continue the swirl look, I placed long adhesive backed strips of blue pearls in a swirly pattern. I think it looks cool, and hope you do too. Everyone needs to send a sympathy card or a get well card now and then. This card could be used for either occasion. First I used a stencil from the A Colorful Life stencil collection - http://techniquejunkies.com/a-colorful-life-stencils/ - and used pale green Art Nuvo Embellishment Mousse - http://techniquejunkies.com/products-and-accessories/nuvo-mousse/ . Then I used Technique Junkies City Watercolors - www.techniquejunkies.com/city-watercolors/ - and heat embossed it on vellum. It was adhered with adhesive from my Xyron machine.The green leaves show up through through the vellum and give it a cool look! 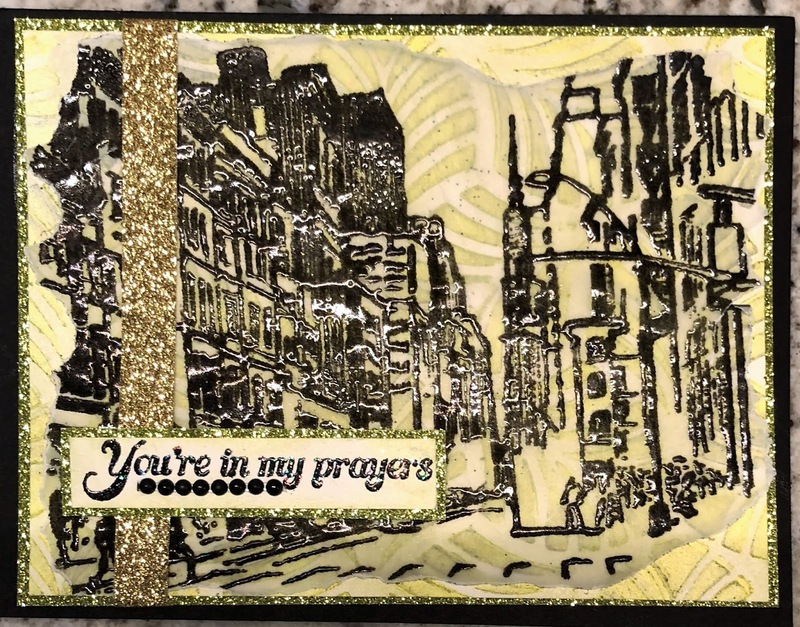 I heat embossed the verse - In My Prayers - http://techniquejunkies.com/in-my-prayers/ - on white card stock and layered it on glitter paper. 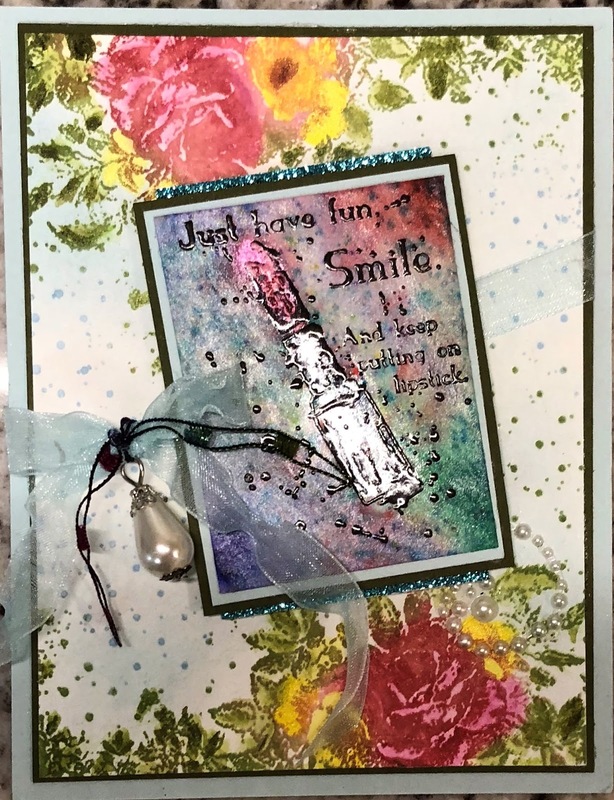 Don't forget to look over all of the lovely stamps and choose several stamps and take advantage of the 15% off sale of new stamps through May 8 but you may also use the TJ10Judy and get 10% off of anything else in her store. www.techniquejunkies.com/sketched-flowers/. 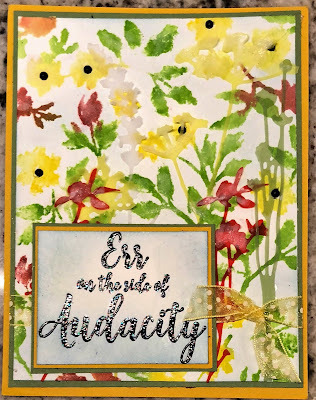 It is so versatile and you may have already seen it used several different ways on the May 1 blog hop. I used markers to ink up the leaves and petals. Then I die cut some vellum flowers and adhered them to card front with clear drying glue dotted on here and there. I added the verse Audacity - www.techniquejunkies.com/audacity/ - (and of course is a Technique Junkies Stamp!) And I heat embossed it. Layers and ribbon bow-knot seal the deal for the card! Remember all of the May releases are on sale for 15% off through May 8. Have you been to the website? Well, if not then why not? techniquejunkies.com/may-2018/:. And you can use this coupon code -- TJ10Judy and get 10% off of every thing else you order! Have a wonderful day getting inky!! A while back, I picked one of the new stamp sets in a particular month and challenged myself to make as many different cards as I could with that set. 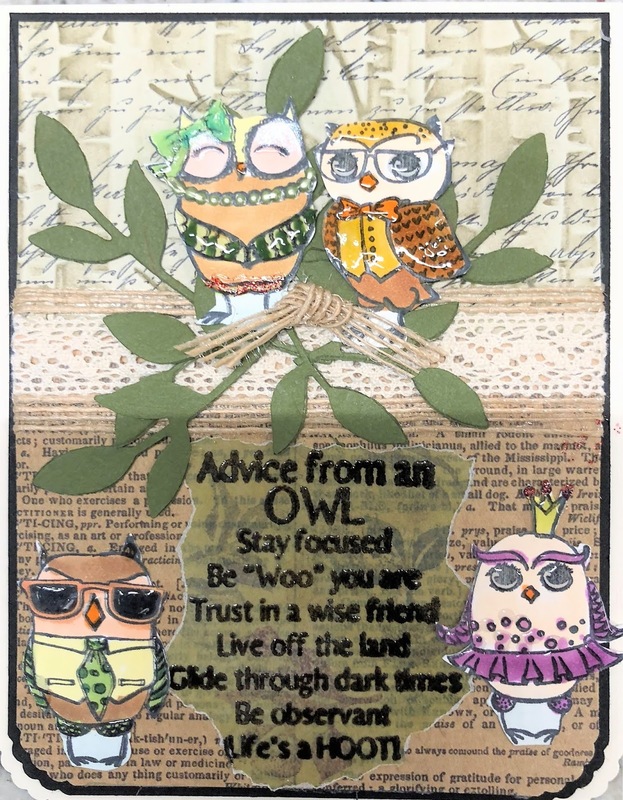 I decided to do the same thing with the new Technique Junkies Stamps You're a Hoot set - www.techniquejunkies.com/you-are-a-hoot-set-of-7/ . I made at least 9 different cards with this set. It was great fun figuring out to design these cards. 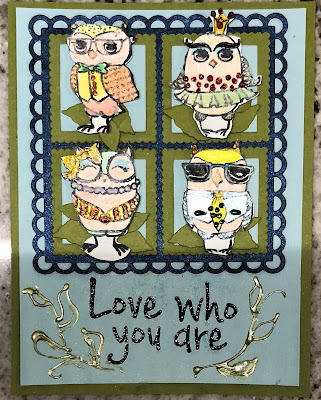 You may have noticed I used 2 of these nine cards on the May 1st Blog Hop. Throughout the month of May I will show case the other cards. Some of the images were colored with Copic markers and some were painted with Twinkling H2Os. All of them use Diamond Glaze (or Crystal Effects, or some other liquid glaze you may have) some where on the owls. Several use Nuvo Glitter drops Nuvo drops here and there on the owls -- on the necklaces, on the ties, on the crowns, and etc. The verse is heat embossed on a small piece of green leafed patterned vellum. I tore around the edges and adhered with adhesive from a Xyron machine. Please remember you can get an automatic 15% discount on every new May release Technique Junkies stamp though May 8! No code is needed! And if you use the code TJ10Judy you can get a 10% discount on everything else! What a deal! Have a wonderful, wonderful day -- and get inky!! Oh Lovely May! Lovely New Stamps! Lovely Discount!!! It is May! I hope it is warm wherever you are located. I am writing this early because of moving back to PA for the rest of the year, and I sure hope May 1 is warm for me! And every month brings new things to mind -- and new stamps for Technique Junkies Stamps! The stamps for May are so great! You can find them all here - techniquejunkies.com/may-2018/. Remember all of the May Technique Junkies Stamps are 15% off through May 8. And you can get a 10% discount off of everything else by the code TJ10Judy. Please start the May Release Blog Hop process here -- https://techniquejunkies.blogspot.com/2018/05/technique-junkies-may-release-and.html . 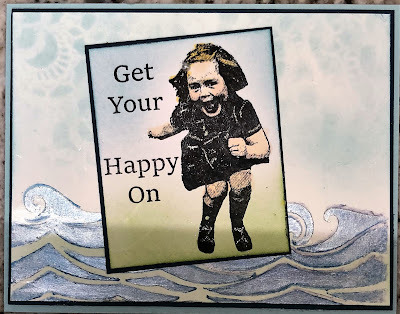 You should have come to my blog post from Ro Donner's fabulous blog and projects: https://rodonner.blogspot.com/2018/05/tj-hop-for-may-new-releases.html. All of my projects today use Technique Junkies Stamps exclusively. This first card uses the new set You're A Hoot! - www.techniquejunkies.com/you-are-a-hoot-set-of-7/. Such cute and funny looking owls! The words are from the same set and are cut into strips, and adhered at an angle. This card uses the set Get your Happy On - www.techniquejunkies.com/happy-on/ . The girl is colored with Copic markers. 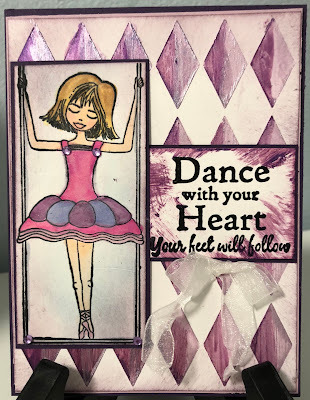 I used Nuvo Embellishment Mousse with a stencil from A Colorful Life Stencils and sponged color over another stencil from A Colorful Life.
. I used small ink pads, markers, and Twinkling H2Os to color the flowers and leaves. I use the stamp Putting on Lipstick (from the February release) - http://techniquejunkies.com/putting-on-lipstick/ - as the focal image. I used Twinkling H2Os to color the image and background. I hope you find the May Technique Junkies Stamps inspiring and wonderful. Please remember that all of the May Technique Junkies Stamps are 15% off through May 8 - NO code needed! And you can get a 10% discount off of everything else by the code TJ10Judy. 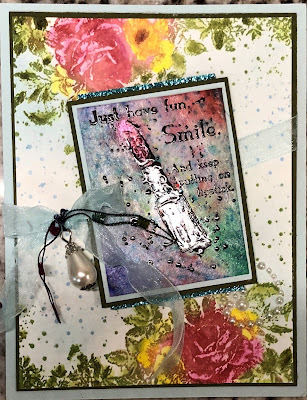 The next stop on the blog hop is with the super talented Beth Norman - http://www.sunflowers-dragonflies.ca/blog/60761/technique-junkie…release-blog-hop/ . You will surely enjoy her projects! Hop along and get inky sometime today!